The Evangelists Matthew and Mark from a Gospel Book, St. Matthew, Walters Manuscript W.530.D-E, fol. W.530.Er, a photo by Walters Art Museum Illuminated Manuscripts on Flickr. These two author portraits once preceded the Gospels of Matthew and Mark in a Gospel book in Mount Athos, Mavra, MS A44. 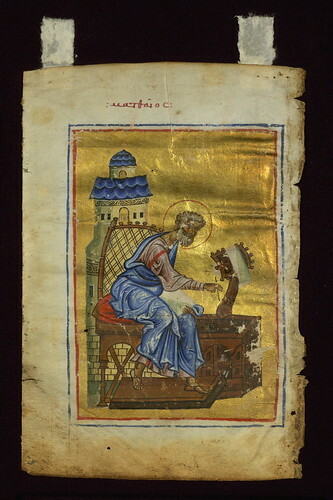 They are attributable to the leading book illuminator in Constantinople during the second quarter of the 12th century. His real name is unknown, and he has been conventionally called the "Kokkinobaphos Master".